(3kg~250kg Anodised Aluminum) standard, 350x350mm and 400x500mm platforms. A direct bolt replacement for most industry standard single point cells. The PT1000 is a dual designed model providing for increased capacities. The smaller cell is from 3kg to 35kg and at only 22mm high and 130mm long it's perfect for small low cost retail scales, medical and check weighing applications with platforms up to 350mm x 350mm. 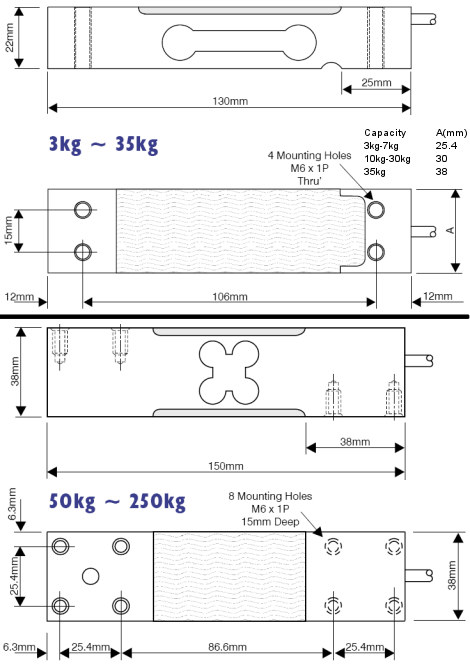 The larger size cell measures from 50kg to 250kg capacity and is ideal for platform sizes 400mm x 500mm. This is a very compact cell for its capacity range. Direct bolt industry standard makes both large and small PT1000's ready replacements for other less well-protected models. The PT1000 comes as standard with SURESEAL sealing and is protected to IP66. Click on the individual products below for more details, documentation and related products.